Impressive build quality and vintage tones. 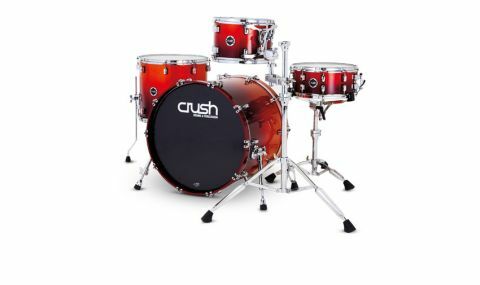 Since its NAMM debut and official launch early in 2011, Crush has rapidly built a reputation in America with its range of innovative hardware design, kits and individual snares. Now, under the wing of distributors Sound Technology, Crush is making its presence felt in the UK. Though formed less than three years ago, the drums and various design elements from this fledgling Florida-based company looks to be impressive. Its range, suitable for players at all levels, encompasses drums and hardware made both in Taiwan and the USA. The various series includes the Alpha starter kits, mid-range Sublime E3, Sublime AXM and a clear Acrylic, up a level to the Chameleon and onto their top-notch Limited Reserve drums. Freshly squeezed onto the drum mat this month is a sparkling four-piece maple kit from the new Crush Sublime E3 series. The Taiwanese-manufactured drums and hardware here include an undrilled 22"x18" bass drum, 12"x8" rack tom, 16"x14" floor tom and a 14"x6" matching maple snare. The assortment of medium weight, robust M4 hardware (apparently inspired by the Sherman M4 tank! ), comprises a double-braced boom cymbal stand, double-braced stands for hi-hat, snare drum and a bass drum pedal. "While Crush's AXM kits have a choice of natural wood finishes, the E3s feature a wide selection of wraps"
The Sublime E3s are an amalgamation of two former series from Crush - the Sublime Tour and Sublime. The new series is the third succession of what Crush calls its "evolutionary process", taking the best aspects from each of the past series. While Crush's AXM kits have a choice of natural wood finishes, the E3s feature a wide selection of wraps. This review set has a beautiful shimmering orange/red wrap, shown to great effect on the deep bass drum with its colour-matched rims. Once applied, the bearing edges are double cut to 45° on the toms and bass drum and a single, sharp 45° trim for the snare. The edges are then triple-sanded and given an application of wax. The inner shell walls are also triple-sanded, resulting in possibly the smoothest surfaces of any drums this writer has reviewed - so smooth, a peach would seem rough in comparison! Crush say the combination of maple, bearing edge profiles and reinforcing rings on the bass drum and toms will all contribute towards a meaty vintage sound. The unyielding 2.3mm-thick steel hoops should help achieve a quick and even tensioning while maintaining an open drum sound. The finish on the reverse flange of the snare head is quite rough and not up to the standard of the rest of the drums or hardware - fortunately this will not affect the sound. The design of the mini bridged lugs is said to enhance the resonance with their low-mass 'bridge' between the fixing points. Another resonance enhancing measure is the rack tom X-mount which straddles the two tension bolts top and bottom of the drum and, with the aid of large rubber grommets, holds it firmly in place without impeding shell vibration. Just in case the front bass drum head is ever obscured, the large metal 'target' Crush badges will help identify the make of the drums from a distance. With two badges on the toms, Crush's detailing ensures one of these will be visible, whether setting the kit for a right or left-handed player. Each tension bolt sports a nylon and a steel washer - the steel washer is faced directly against the head of the bolt, while the nylon butts against the steel hoops and bass drum claws to help avoid any detuning. Crush's eye for detail is also evident with features such as the profile of the bearing edge on the bass drum. This has a fully rounded profile on the front head but a sharp pinnacle on the resonant. On a drum this size we would have thought the effect this has of a slight reduction in resonance of the front head would be extremely subtle, but again that's all in the detail. This drum has an intriguing set of lugs which shows a tantalising glimpse of the integral claw gaskets. These are given several tasks including protecting the wooden rims and the claws too - with two Lego-like blocks standing proud of the tuning bolt heads. This also stops the tension bolts from rattling about and, due to the size of the bass drum claw, allows the tension bolt plenty of room to self-centre - ingenious. The hardware pack features double bracing and a nifty toothless tilt mechanism on the cymbal and snare stands. This allows infinite angle adjustment via a DW-style lever - once held in position, without the usual teeth/gearing, the tilts lock firmly in position. The only aspect of the hardware that is not to our taste is the camo army green colour of the hi-hat and kick pedals. Crush does support the armed services in the States and we think this may have a bearing on the choice of colouring. Before we take the sticks anywhere near these new drums, there's a small matter of installing the heads on toms and bass drum ￼￼￼- fortunately the snare has them both in place. The process takes much longer than usual as we stop to admire each design element and check once more to see if those shells really are as smooth as when we first looked at them. As the head slack is taken up, finger-tight, the tuning components respond swiftly and smoothly. With just a couple turns of the key and the occasional palm press at the head centre, the drums are ready to go. "These are incredibly easy to tune and the chosen hardware angles are achieved rapidly"
These are incredibly easy to tune and the chosen hardware angles are achieved rapidly - this all helps speed things along so we can get playing. We quickly discover the toms have just the right depth so they don't have to be pummelled before they burst into life. Whether giving a delicate tap and tickle or, when necessary, a hefty thump - they deliver at all stick velocities, producing a rich, warm 'dooooom' sound. One of the biggest surprises here is the 6"-deep snare drum - this sounds much thicker and far richer than its diminished depth might suggest. It has a gorgeous woody 'thwock' and, courtesy of the reversed flanged hoop, a well-controlled overtone. The hoop also provides us with some tasty cross-sticking and impressive rim shots. Upon each hit you get the immediate crack and a nano second later (or even sooner! ), the wood shell thickens the sound, creating a fat blast. However, the distance between the two heads of the bass drum warrants a good wallop, but this is worth it as with each strike it truly kicks. With a drummer friend sat behind the kit, this writer can confirm that this drum is powerful and can be felt at the back of any mid-sized venue. Overall the drums are well-balanced, with no individual drum perceivably louder than the other. This is where the kit blends as a whole instrument rather than a collection of individual drums - with its range of dynamics, scope of tuning and versatility, the kit would be equally capable on stage or for recording. The sound is impressive and the detailing and build quality of the individual drums and certain aspects of the hardware is notable.